…she’ll want to hang it in her kitchen. But first, she’ll probably need to make repairs to her ceiling. 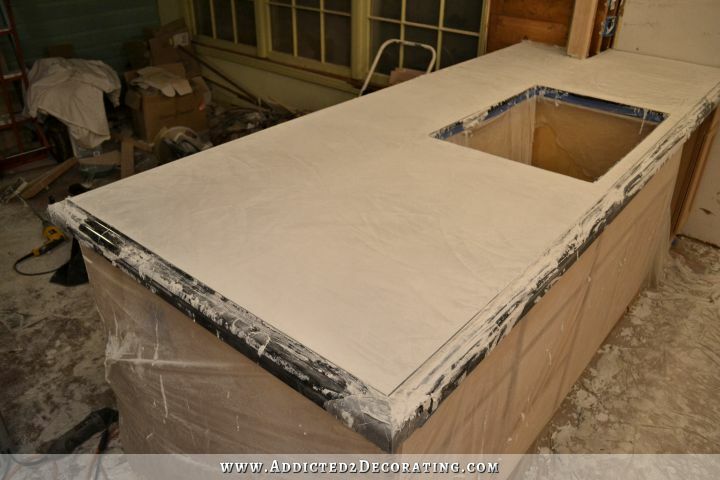 …by skim coating it with drywall mud. Then she’ll have to decide what to do with the wall to the left. 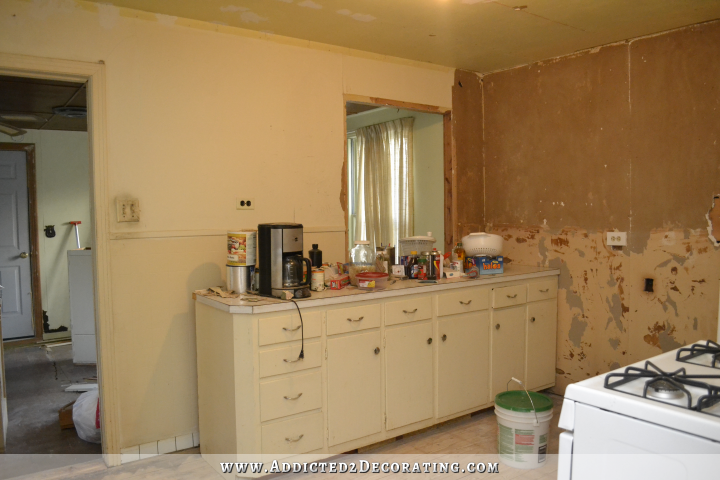 Should she close it up temporarily and do a quick and inexpensive kitchen makeover? Or should she take the wall down according to her long term plan? She’ll probably get carried away, and decide to take the wall down herself, with the help of her brother. 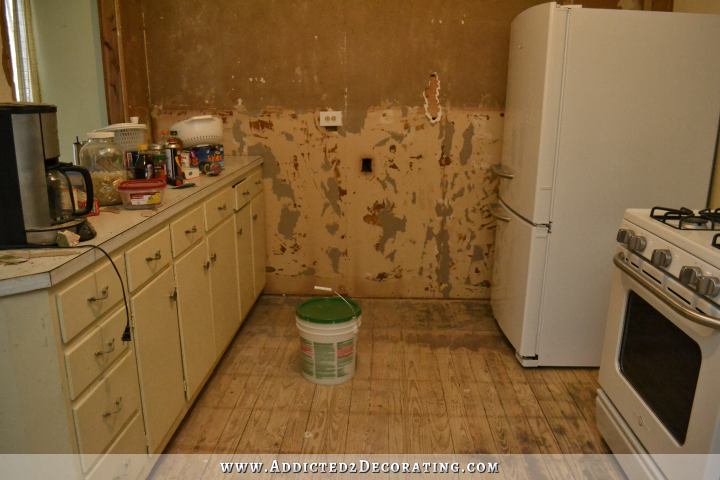 And next, she might want to remove all of the old kitchen cabinets, as well as the old drywall behind the cabinets. 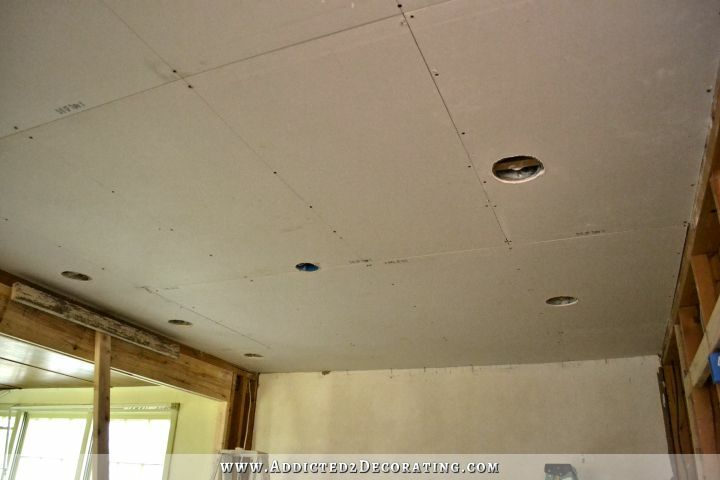 Then she’ll probably want to upgrade all of the old electrical wiring in the room, so her brother-in-law will suggest taking down all of the old drywall. And once all of the wiring is finished, she’ll need to install all new drywall. And next, she’ll probably want to paint her new floor. Then she might want to install new kitchen cabinets. …and then customize them with lots of trim and fancy feet. 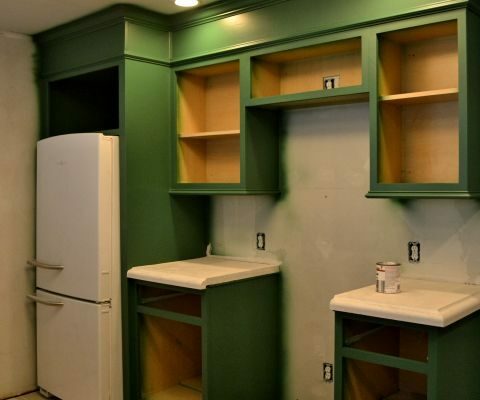 Once the cabinets are installed, she’ll probably want to pour some concrete countertops. 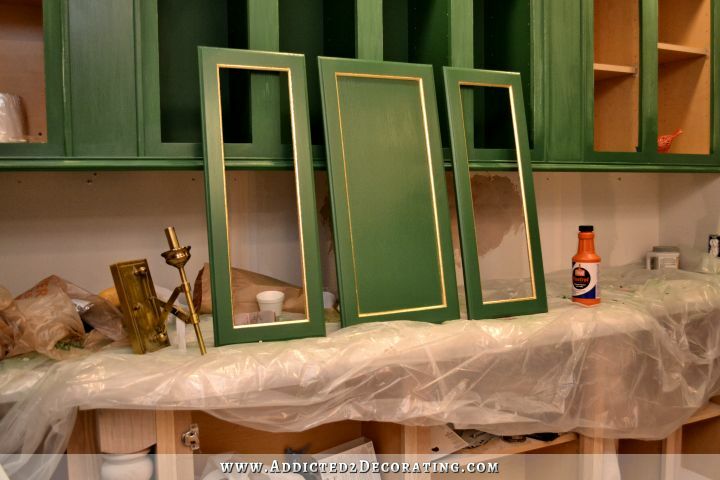 …and add gold leaf to all of the doors. 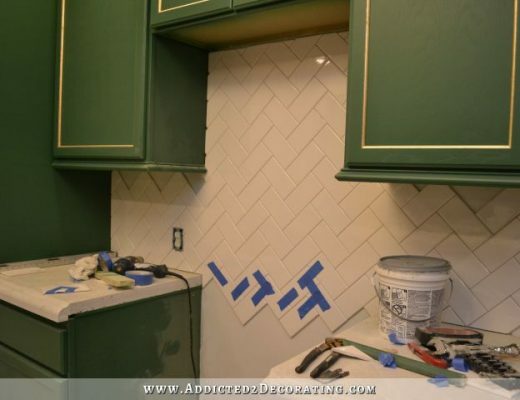 Next she’ll probably want to add tile to all of the kitchen walls. And then she might add trim around the doorways. 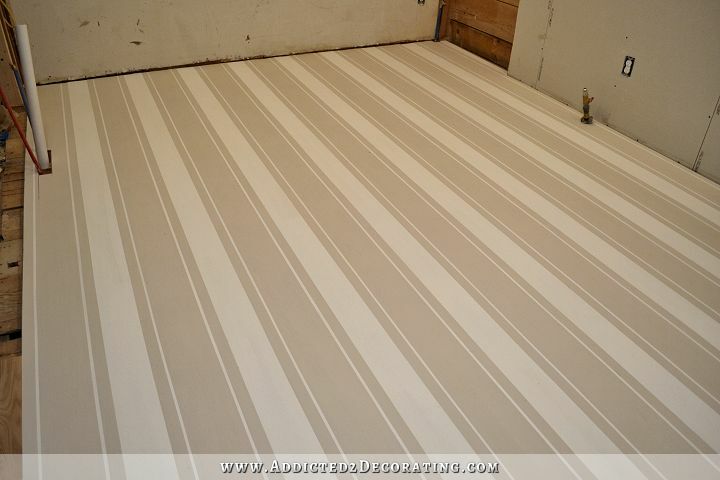 At this point, she’ll probably realized that her striped floors aren’t the best look for her kitchen, so she’ll want to sand them and refinish them. 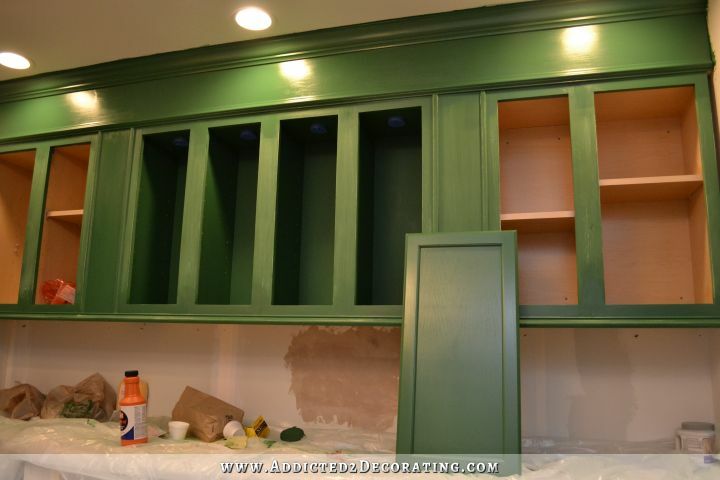 Next, she’ll make a dreadful mistake and leave her freshly painted cabinet doors and drawer fronts out in the rain. They’ll be ruined. So while she orders replacements, she’ll probably want to install cabinet hardware and corbels. 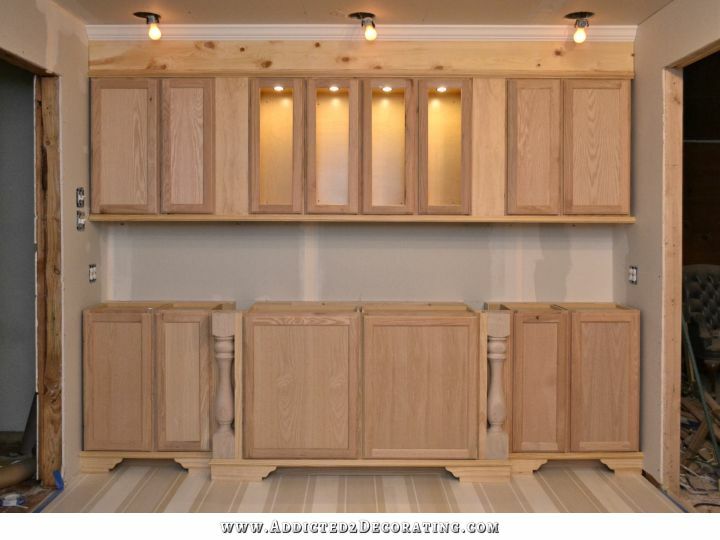 And when the replacement doors and drawer fronts arrive, she might want to finish the cabinets as soon as possible. 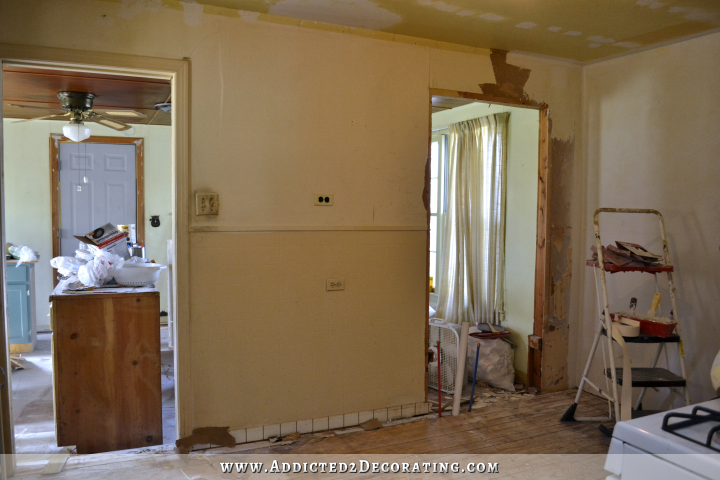 And with her kitchen remodel almost finished, she’ll be so excited about what she’s accomplished that she’ll start devising a plan for the adjoining breakfast room. If she devises a decorating plan for her breakfast room, she’ll ask for a new light fixture. This post was great!! Thank you for the laugh, I love that children’s book!! And wow when you put it all into one post it highlights how much you’ve accomplished!!! LOL. That is how it goes too. 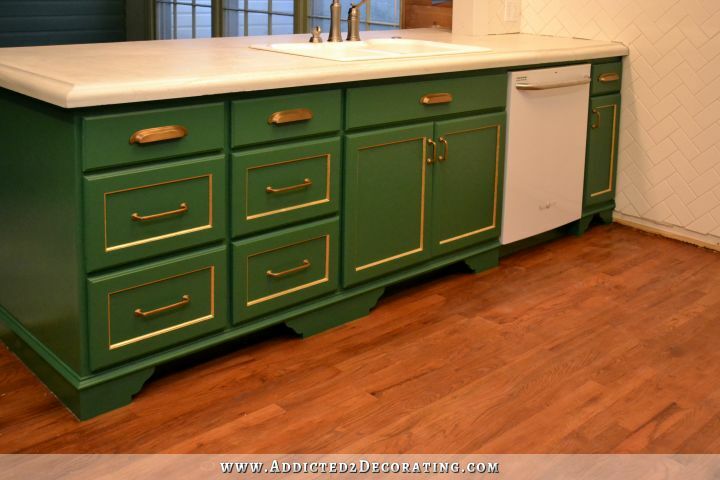 I once redecorated my kitchen to match some awesome kitchen towels I found. By the time the kitchen was finished the towels had faded from washing. I had to shop for more kitchen towels. It never ends. 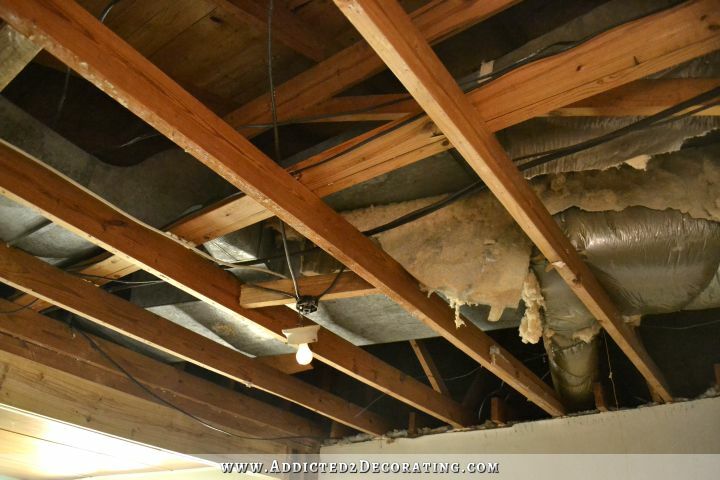 You left out a massive project – taking all the ductwork out of the ceiling while it was open (at your brother’s suggestion). 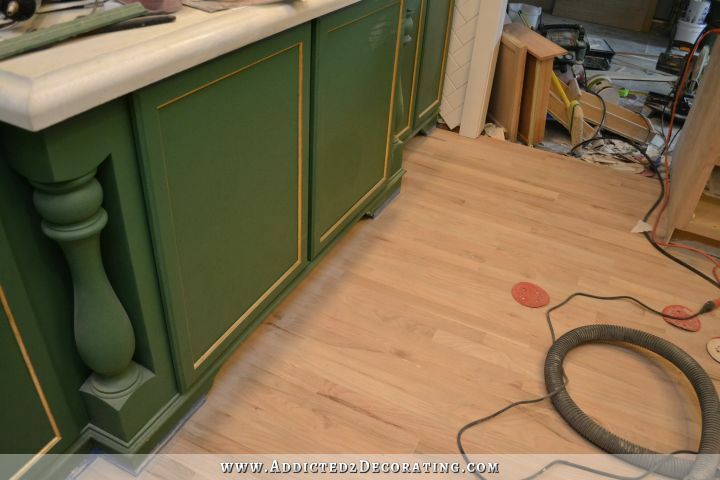 We are already seeing ideas for the breakfast room changing, fine tuning, pinpointing what is perfect for you home and I so enjoy going on this DIY journey with you. love it!! Oh my goodness…that was great! And that’s the exact book title my husband has given me when we work on our house. LOVE IT!!!! 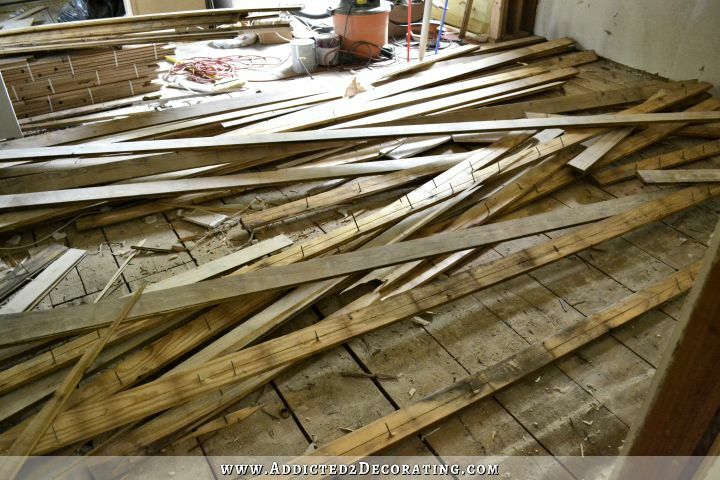 This is my favorite sentence when remodeling a room…..”Well, as long as we’re doing that we may as well do this”….and so it goes. My ex and I called it the “might as well” syndrome when we were renovating/building my house. As soon as you do one thing the dominoes start to fall and you might as well tackle – insert whatever here – while you’re at it. I ran into that by the simple fact that I put new paint on the walls/ceiling of my bedroom. I realized that the lovely almond plastic switches/outlets and covers had over the last several years morphed into a perfectly disgusting dirty looking mustard yellow. That was not going to do on black and creamy white walls. So, off to the local hardware store for a whole new set of switches/outlets and covers for the room. Oh, and I need a new overhead light fixture too – which I haven’t yet decided on. 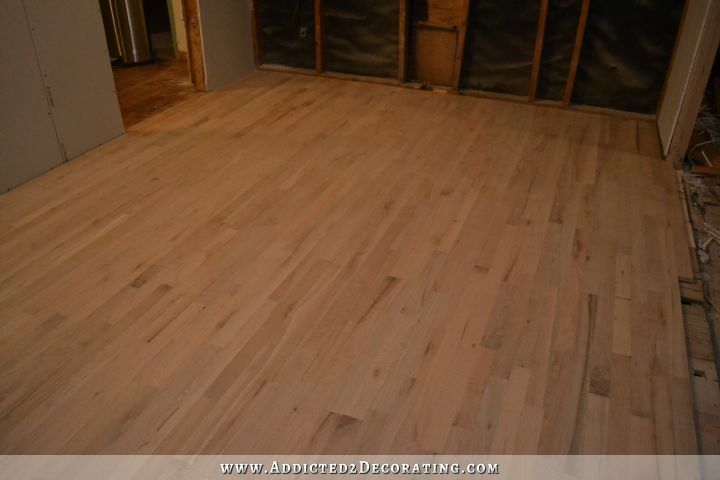 As the saying goes, “You’ve come a looooonnnnggg way, baby!” What an amazing story – it should win a prize, and YOU should win a prize for all the hard work, blood, sweat, and tears you’ve put into this remodel. Thanks for allowing me to follow along – I’m sitting on the edge of my seat waiting for The Big Kitchen Reveal! The suspense builds!!! This is great to see all of the steps and how one thing has led to another! 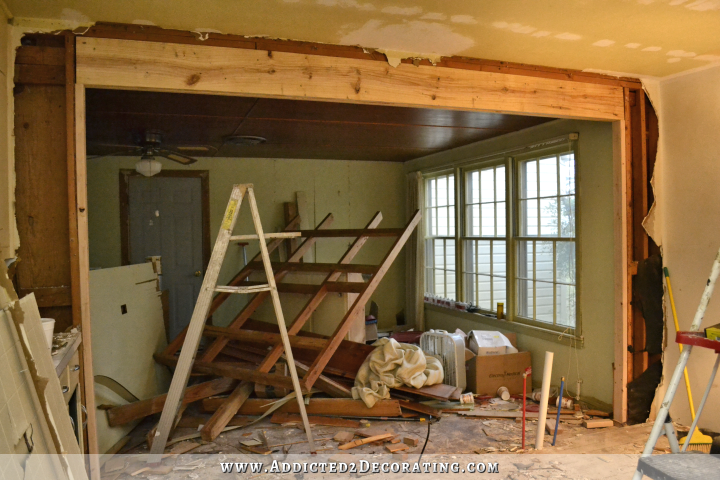 It’s been so long since I’ve seen the early stages – taking out the baseboards, doing your own drywall etc. How far you’ve come! 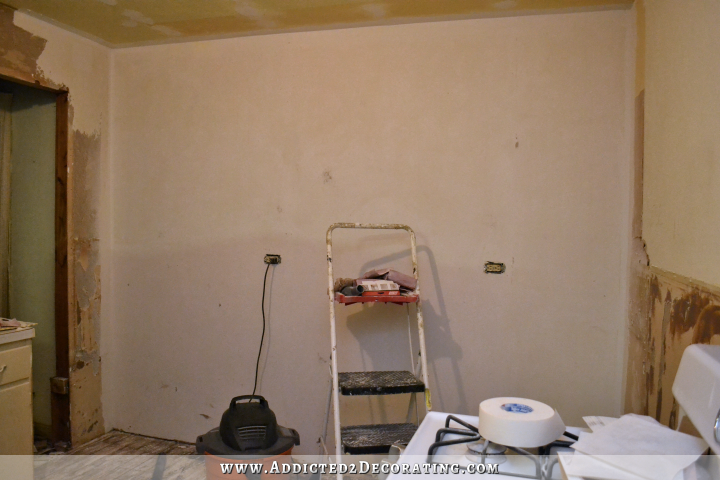 I hadn’t realized that you did the drywall yourself in the kitchen – was it a nightmare? 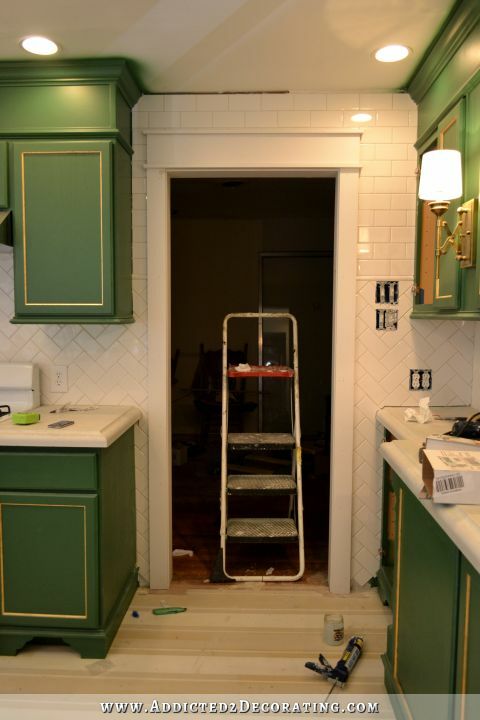 If not, then it might be worth it to DIY the breakfast room if you keep getting $2600 quotes. I’ve been reading blogs for years; yours is one of the few I still love. Keep up the wonderful work! I am so impressed with your tenacity, crazy skills, and design savy!!!!! I really look forward to reading your post each day. Blessings to you! I ditto that! Impressive reading/watching day-by-day but wow, so inspiring when reading and seeing the journey. One of my favorite posts ever! Although, I have to say as I was reading, I started getting excited at the thought of seeing the completed kitchen photos. Tomorrow, perhaps?! Loved that! You are such a great writer! You should get this under some publisher’s nose, I’d buy the coffee table book! So precious. You are just as good a writer as a home improver. I’m far to lazy to read all the comments on your blog so maybe this has been said before….but I wanted to take a moment to thank you for showing us the real process of DIY. Like you, I often start with an idea and it evolves MANY times before the final product. It takes a lot longer that way but it just works for me and I’ve learned to enjoy the roller coaster ride as I discover just what I want. In the end, I think the projects look all the better for it – and less like everyone else’s. It’s encouraging to see someone make an end product that is as beautiful and well thought out as you do and know that the end product was a PROCESS not a formula. Thank you. That was such a great walk down Memory Lane. 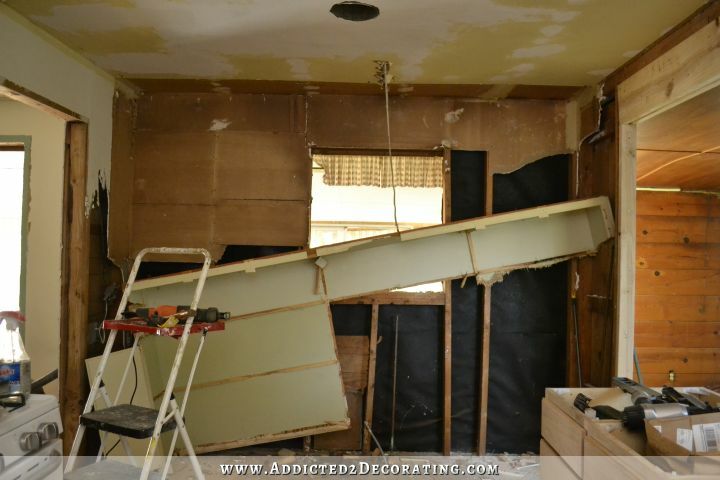 I discovered your site right about the time when the ceiling drywall was going up. This is such a great reminder to take pictures of the process. I love getting to the end of a project, but having comparison shots and also reminders of the problem-solving that happened along the way would really remind us of how capable we are. Thanks (again and again) for the wonderful peek inside your world! Awesome Post, You Inspire me……. You do so many things that I wish I had the guts to attempt! Keep up the great work…….. Loved this post! I loved watching your “kitchen adventure”! You are truly inspiring. I love how you can find ways to bring beauty to homes while on a budget. That is amazing on it’s own, but the visions you have and results you achieve are spectacular. I only read your blog everyday, no other blog has kept me involved and inspired like yours. You go, girl! And thus, the wonderful story continues! I can’t hold my breath, but I impatiently await this next chapter! That is the best blog post I’ve ever read – Love it!! It’s just beautiful. Great job! Looking at the photos from beginning to almost completion it really is an amazing transformation. I think it looks absolutely fabulous Kristi and I have really enjoyed following your journey! I love this story so much that I read and translated it to my husband right now – and we both are in awe at what you did and did and did to make that room so perfect and lovely! Cannot wait to follow the process in the breakfast room – thanks for sharing! Artistic, mad DIY skills, and an excellent writer to boot! The kitchen is beautiful. Cooking in there should be fun! Hah! This was great. Because I only discovered your blog at the kitchen cabinet stage,* I didn’t know where it all began. I love your choice of lighting for your breakfast room – I’m so glad you found it in your price range, because it’s perfect. Just wanted to say that I got home and was able to look at your pictures on my computer, rather than on my phone. My god, what a job you did. I had no idea what an enormous undertaking it was! It’s an astounding accomplishment, and you should feel very, very proud of yourself. Amazing, truly. Oh the Places You’ll Go……. That was GREAT!!! Thank you for a big smile! You are such an entertainer. And I have loved every step. I’m going back to look at it all again. Love seeing the peninsula finished. It’s so beautiful, just like the rest of your kitchen. I’m excited about watching your breakfast room now. I think Matt would be smart to buy you a new light fixture for every room. LOL. What a fantastic post! The ONE item that stood out the most for me was “she’ll” ,,,do this,,,and “she’ll,,, do that! Looking at those first photos, and realizing that YOU did this for the most part on your own is nothing short of astounding! AND furthermore, you added your own touches, to customize as you went along,,,AND,,,in the grand scheme of things,,,,you probably didn’t spend too much more time in there than a group of contractors would have spent in there and charges you a small fortune to do it! I am so proud to say that I follow this blog because it IS REAL! It follows a lady that knows how to get things done, and prove that you can do things like this on your own even if it means having help with a hubby or partner, a beautiful space CAN be created with hard work and an imagination! It doesn’t take an open wallet to make things change in such a drastic form! You really are the best at this – if I only had one blog to choose from, it would forever be THIS one! Keep up the great work! I’m forever hooked on your adorable little self, and your adorable blog!! That’s hilarious! And why I love those books so much. 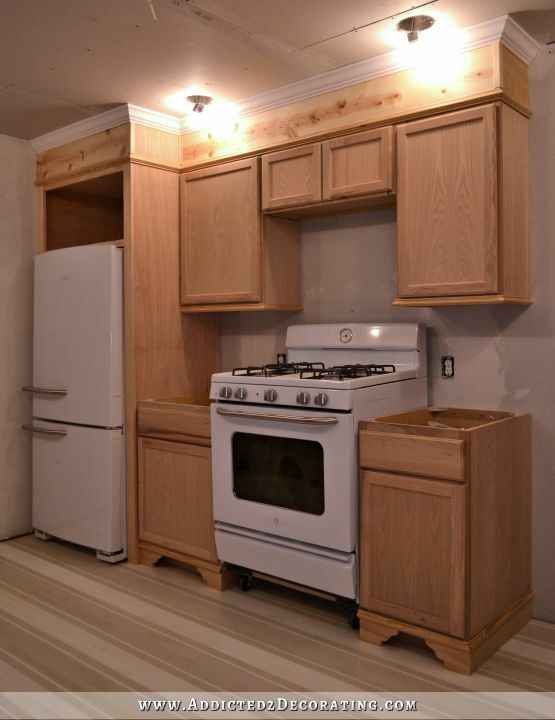 You really have done an amazing job on your kitchen…failures and new design choices are what keeps it real. 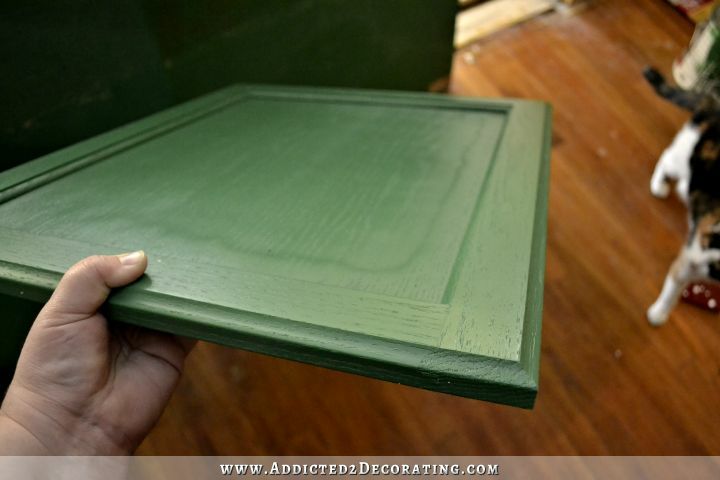 Take the time to create some side by side before & after shots for Pinterest….that’s how I found your blog…..it was that spray painted shower stall…and I was hooked. (And why yes, I did spray paint mine too shortly after!) You’re awesome! Haha! Too awesome for words!! I know how this works…I once bought some wallpaper for $3 per roll that resulted in new wood floors for the kitchen, appliances, new carpet and furniture for the LR and DR and new window treatments for all three rooms. Love it when that happens! It’s been so great to watch every little detail come to reality and you just couldn’t get a better or more beautiful kitchen if you tried any harder. Congratulations on a job very well done, Kristi! You ROCK! Tee hee hee!!! I knew this post would be really good, so after reading the opening line I ran to my daughter’s room to share the rest of it with her (I’ve been keeping her abreast of your progress). Even a 17 year old had to smile at this one! 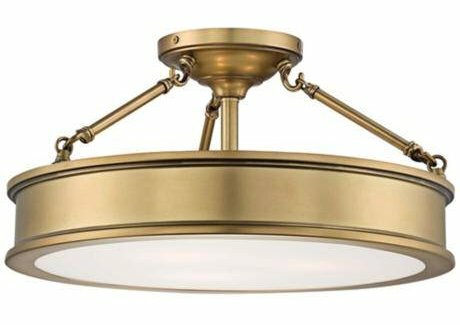 I wondered how you were going to make it come full circle–completely forgot that you just ordered a light fixture for the breakfast room! Thank you so much for helping me realize I’m not a crazy person as I begin project after project and interrupt projects with other projects. I know, like you, that I will get it all done some day!! 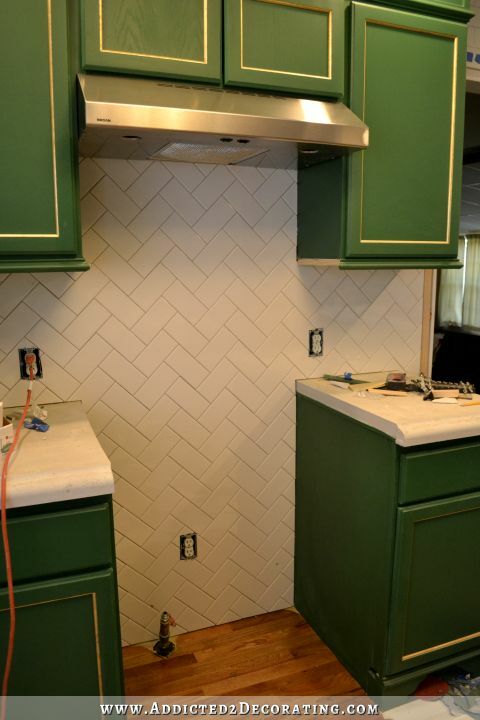 That was an awesome way to recap your kitchen makeover! Creative, yet informative. Great job, Kristi! Can’t wait to follow along with your next project! This has been a awesome journey with you….Can’t wait to see more! Ha Ha!!! Bravo! Well Done! It looks fantastic Kristie! Congratulations!!! Can’t wait for everything you’ll do in the Breakfast Room. BTW, I think ? (the person that found the stencil, and light for the Breakfast Room) is an enabler, not that that’s bad! LOL! Oh my! Can’t stop laughing! i really enjoy journeys with you! (sigh) I’ve had days like that. mmmm – breakfast (room) cupcakes! P.S. Can’t wait for the big reveal! I love how you told this story! 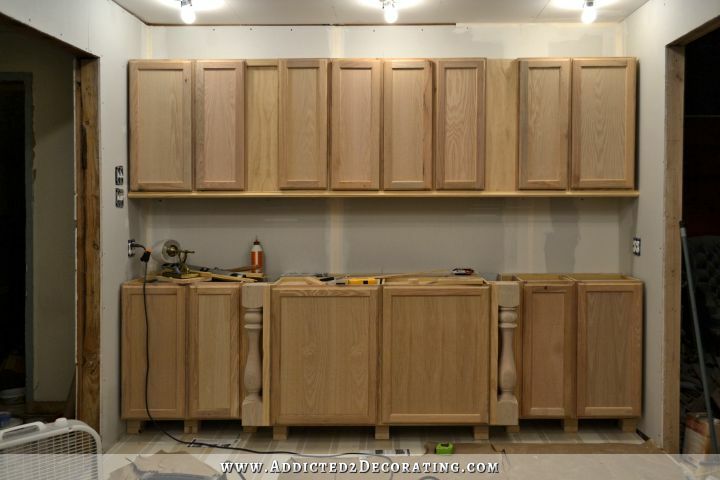 Your kitchen is AMAZING, and next will be your breakfast room. Can’t wait for the official kitchen reveal!! Hurry please! You are so talented. I look forward to your post each day to see what you have done next. You amaze me at all that you do without any help. Pat yourself on the back, you deserve it. You are making a beautiful home for your family. I’ve been lurking on your blog for months now, but had to comment on this one. That was one of my favorite books as a kid, to the point where we call certain problems “cookie problems” because of the domino-like sequence of events they’ll kick off in trying to address them the right way. Ha! Love it! I swear we are related. I totally relate to the way you do things and I have to say that I feel a bit more sane knowing I am not alone 🙂 Can’t wait to see what you do next. This post was so clever that it got me out of my shy mode to comment how amazing I think you and your blog are. There is simply no one out there doing what you are doing. You are the best! 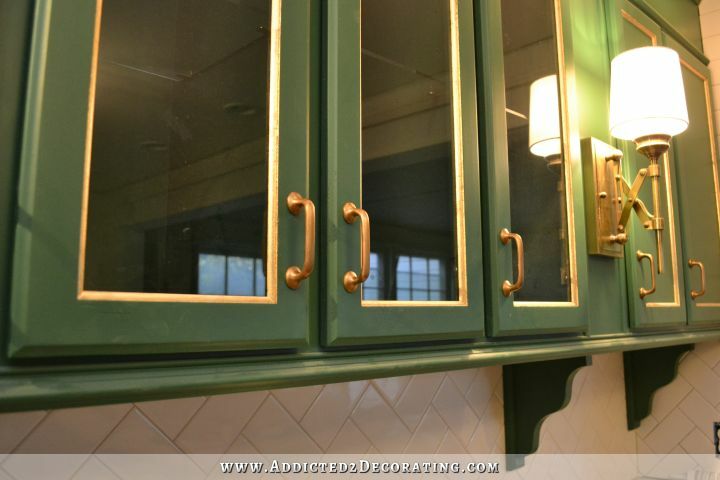 Great (and cutely told) summary of all the work done in your gorgeous kitchen! So amazing all the work you have done yourself in here. Hahah! 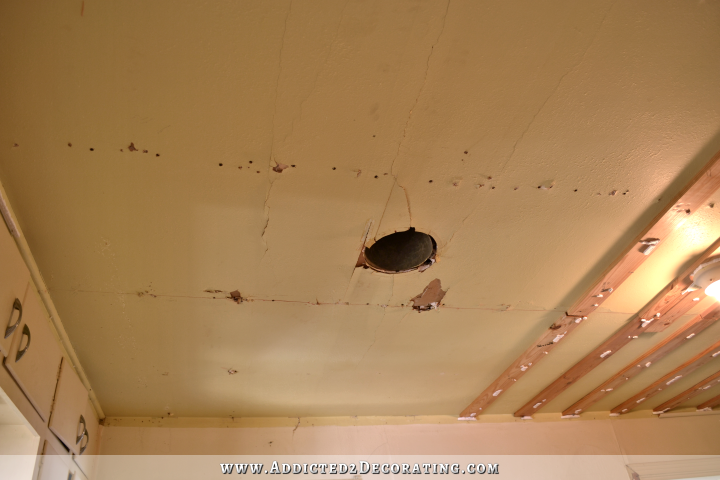 I love that you didn’t show the actual light fixture on your ceiling, not even once! LOL! Great post. 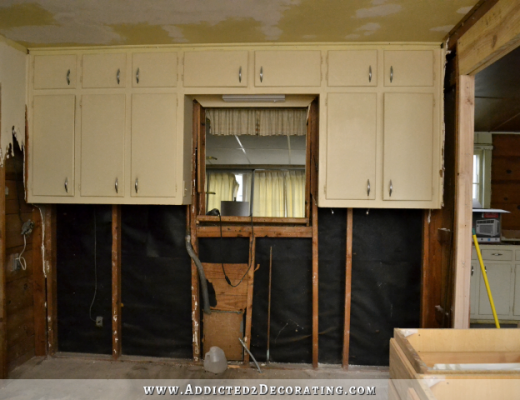 I’ve only recently discovered this blog, so it was fun to read where the kitchen reno actually started. When I start doing something at home my comment is always “how hard can it be?”. My boys groan when I say that as, from experience they know it will be a lot harder than I anticipated. 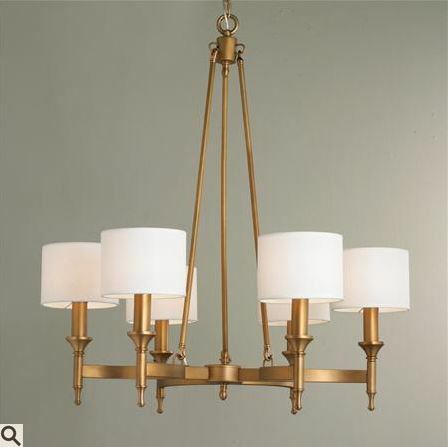 I was eyeing this copper chandelier – I liked the price!